Today marks the first appearance of a techno / trance group on The Blah Blah. Here at The Blah Blah we’re always branching out into new territory and covering music that others fear to even consider. It’s hard work, but somebody’s gotta do it. To the left, you see a photo of the McNamara Terminal of Detroit Metro Airport. As you walk the terminal, colored lights pulse and shimmer to the beat of ambient electronic music. Watch a really long video of it here. 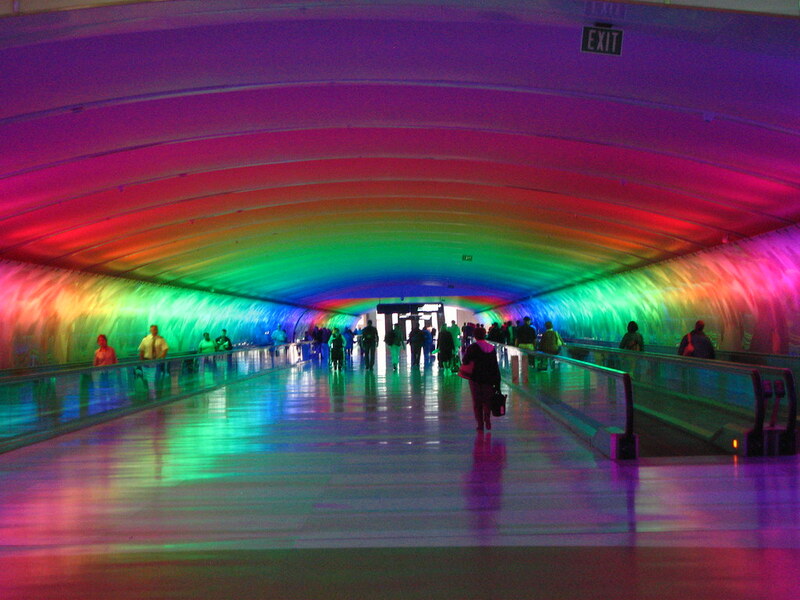 The reason you’re seeing Detroit Metro Airport is because I was unable to find any photos of Tek^tonik on-line. In fact, I could find very little about them on-line, but what I could find I’ll let you in on. Tek^tonik, who has a really hard-to-type name due to the ^ inserted in the middle, is Robbie Bronnimann and Andy Ross, both from the UK. My wife found them on e-music while searching for Christian techno. Besides being in Tek^tonik creating electronic music, the both Andy and Robbie have worked on producing a number of albums. Most notably, Robbie just finished producing Andy Hunter’s new album Colour, due out digitally in December through iTunes. I’ve been through that terminal… crazy. When I saw the title of this post, Andy Hunter was the first thing that came to mind. Yeah, I like Andy Hunter’s stuff. It’s a good middle ground between straight-up dance / techno stuff and pop. they’re very relaxing, so even if someone’s not really into techno/electronic music, it’s nice for background, and you don’t have to worry about strange subliminal vocals talking about weird stuff while you’re listening or falling asleep or studying. hey jake, you should put up that dance chapel link…i don’t have it on the laptop here or i’d do it. Sure. That dance chapel link is http://www.dancechapel.com. It’s a radio show in Michigan that does Christian electronic / dance / techno stuff. « Defining Christian Music – Does it Even Matter?